Written by Kelsey Marchand on 24 June 2014 . To start us off, we picked Sparklines. Sparklines are compact line charts, most often used to highlight the trend of a series of data points over time (this can be anything from web traffic, to productivity numbers, to expense numbers). First introduced by Edward Tufte, an expert on information design, sparklines have been described as “data-intense, design-simple, word-sized graphics”. Real estate on any dashboard is limited, and when a dashboard requires a lot of data to be useful, it’s absolutely crucial to keep that data compact when translating it into visuals. Sparklines are small graphs designed to convey trends in a small space; perfect for when space is limited. Sparklines take up a small amount of space because there isn’t much to their design, as you can see in the example above. This makes them the perfect visualization for highlighting details and trends and providing context to a particular data point. They do not include many of the elements found in traditional charts (like axes and coordinates), meaning their strength is in their ability to highlight trends, rather than provide information. With their minimal design also comes a catch. Sparklines don’t have an axis, and while this is great for saving space and getting to the point, it can be difficult to standardize. You need to be sure that each sparkline starts with the same baseline, and that all of the charts are using the same scale, otherwise, your data can be easily skewed. RECAP - sparklines are compact line charts minus the contextual data, making them the perfect viz for supplementing other data via highlighting/providing context. 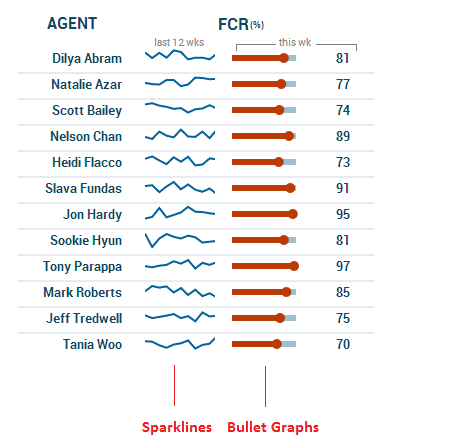 Check out this sample of a scorecard featuring a sparkline from our Data Visualization Gallery.